50 Quilts in 50 States for Inflammatory Breast Cancer! Home/General/50 Quilts in 50 States for Inflammatory Breast Cancer! Sheryl’s post that was our inspiration! Inspired by my sweet friend Sheryl Mesloh. I have a idea, no, a plan. A plan to have 50 quilts done, one from each state in the United States, to help encourage women do what women do best, to talk to each other and share information, support and education about inflammatory breast cancer. The idea is to have 50 quilts, to blanket the United States, by the deadline of October 2015. We don’t have to wait to the deadline. We can receive quits from lap to bedspread size, as they are completed by the maker. We could even accept more that one per state! 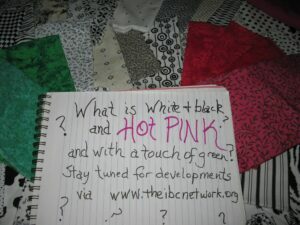 Let us know you are doing a quilt to be a part of our project. Post photos as you go, or surprise us! We will select quilts for display and we will find an appropriate places in each state to display and possibly raffle or auction them off. All funding collected will be applied to inflammatory breast cancer research via The IBC Network Foundation. This will be a combination of physical and online events, and again the deadline is October 2015 for our final goal of coverage of 50 states. Don’t live in the US and want to be involved? Just follow us on facebook and we will expand as we see support!